Tim Nickles made his first sale last winter in the Copper Mountain parking lot. A customer had responded to a Craigslist post for his rooftop car tent and they made the deal on the spot. 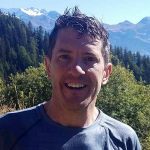 That moment led the former molecular biologist to stake out a new career with Roofnest, his Boulder-based company selling fiberglass hard-shell tents that perch on top of sedans, minivans and other larger vehicles and sleep two to three. After launching the business in January, Nickles has sold 100 models for a total of $200,000. Roofnest joins a crowded industry of recreational shelters. 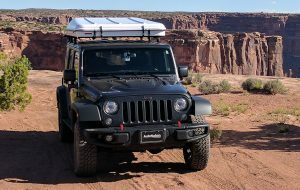 But while some Colorado makers of adventure rigs – Into the Wild Overland, BearPaw Campers and Vintage Overland – prioritize the ability to get off-trail, Nickles prioritizes what adventurers might need the most: a good night’s sleep. The road to Roofnest started in Chamonix, France, where Nickles has traveled for 10 years to ski and mountain bike. A European friend there had a rooftop tent, which Nickles said are more common in Europe than in the U.S. He paid for a prototype, assembled it on his van and put up an ad on Craigslist just for fun. The Alaska native moved to Boulder in 1990 to attend graduate school for molecular biology at the University of Colorado. Since then, he has worked as a molecular biologist, in residential real estate and at the wildlife nonprofit Wild Foundation. Nickles invested $50,000 to get Roofnest off the ground, borrowing $8,000 from his mother, maxing out three credit cards and taking out a $12,000 loan on his car. He taught himself web design and launched the company’s website in January. By March, the rooftop tents, manufactured in China, had arrived. So Nickles quit his part-time job at Wild Foundation. “Most, if not all, of the tents were already sold by the time the shipment arrived,” he said. Shipments have snapped up quickly, as the firm already sold off nearly 50 tents that arrived this month. Nickles has hired one employee to help with sales of the product, which are stored at Acme Distribution Center in Aurora before shipping to customers. Roofnest keeps costs low by not having dealers or distributors – customers can purchase the tents only on its website. The fiberglass shells are weatherproof, and Roofnest also sells awnings that attach to a car’s roof for extra protection and shade. Nickles said it takes 20 minutes to bolt the tent on top of a vehicle and less than a minute to push the top up and hunker down for the night. Roofnest has other competition in the vehicle rooftop tent niche, such as California-based Tepui Tents, Bigfoot Tents and Tennessee-based Cascadia Vehicle Tents. Roofnest tents come in five models ranging from $2,200 to $2,400. Each tent comes with a mattress and a ladder. One model, the Sparrow X, comes with a roof rack to carry mountain bikes, paddle boards or other gear. 2 Comments on "Boulder-based rooftop car tent maker off to a hot start"
I’ve had sprinters and trucks, but the size of big rigs in the city is tough for parking. 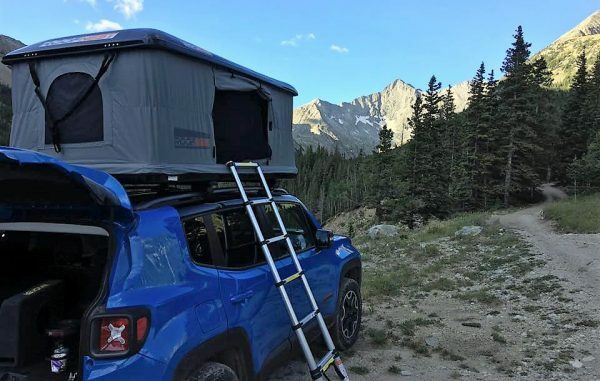 I see the smaller version of this as a great option for an urban lifestyle, but with the escape capabilities of a van or a truck with a camper. First you have to buy a car that will support someone’s weight on the roof. I can imagine having to condemn my car because the roof is crushed after using this product.